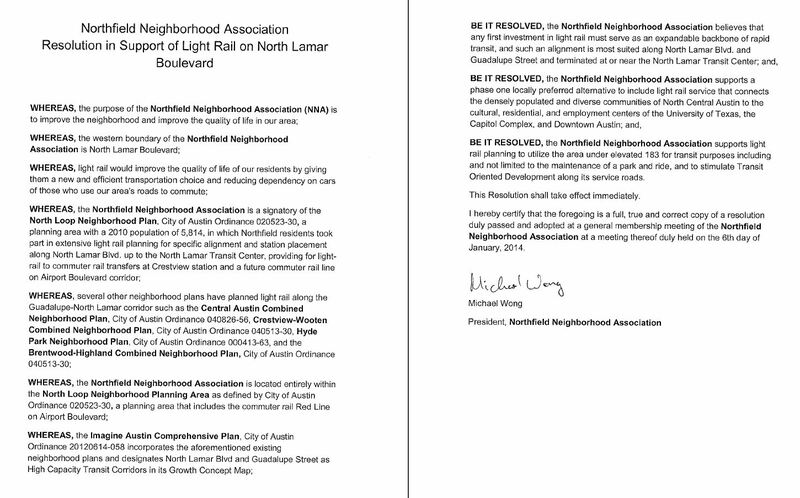 Northfield Neighborhood Association: “First investment of light rail” should be Guadalupe-Lamar! Left map shows Northfield Neighborhood Association (shaded brown) in central-city context, between North Lamar and I-35. Right map zooms in on the association’s boundaries, with the MetroRail Red Line (labeled as “Austin and Northwestern”), albeit with no stations, cutting through its easten side. “University of Texas” section just southwest of Northfield is UT’s Intramural Fields property, which has been used for athletics and a park & ride facility for UT shuttlebuses. Maps: Northfield NA. They just keep piling up — community and neighborhood endorsements of urban rail (light rail transit, LRT) for the Guadalupe-Lamar (G-L) corridor as a key public transport “backbone” for the heart of the central core city. 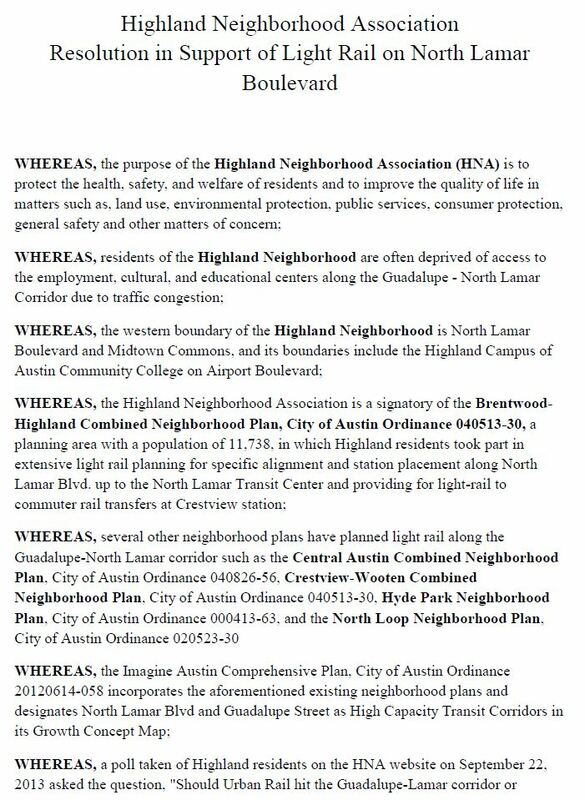 This time it’s a resolution passed unanimously late last month by the Northfield Neighborhood Association (NA), basically located along the east side of North Lamar just south of the Highland NA. 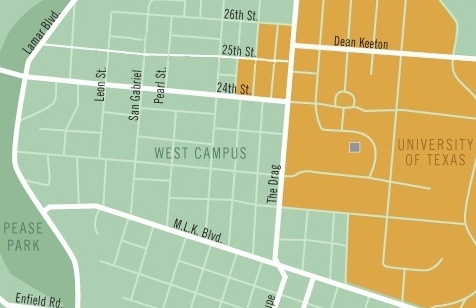 According to the association’s website, the boundaries of Northfield Neighborhood Association are defined by 51st, Lamar, Airport, and Koenig (see map at top). 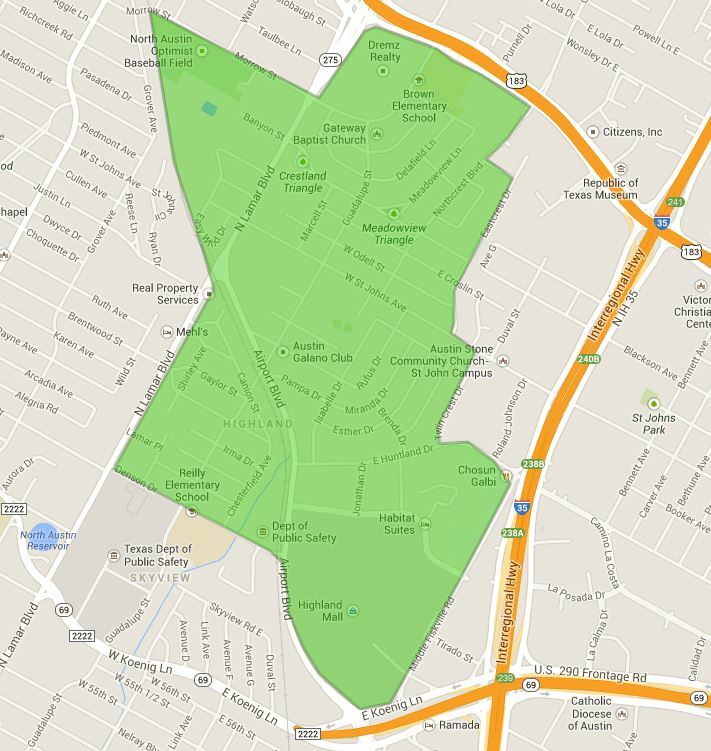 There are approximately 1,400 households in the neighborhood. … There is also a thriving local business scene on North Loop Blvd and two of our border streets: Airport Blvd and Lamar Blvd. …the Northfield Neighborhood Association is a signatory of the North Loop Neighborhood Plan, City of Austin Ordinance 020523-30, a planning area with a 2010 population of 5,814, in which Northfield residents took part in extensive light rail planning for specific alignment and station placement along North Lamar Blvd. up to the North Lamar Transit Center, providing for light-rail to commuter rail transfers at Crestview station, and a future commuter rail line on Airport Boulevard corridor …. …several other neighborhood plans have planned light rail along the Guadalupe-North Lamar corridor such as the Central Austin Combined Neighborhood Plan, City of Austin Ordinance 040826-56, Crestview-Wooten Combined Neighborhood Plan, City of Austin Ordinance 040513-30, Hyde Park Neighborhood Plan, City of Austin Ordinance 000413-63, and the Brentwood-Highland Combined Neighborhood Plan, City of Austin Ordinance 040513-30 …. 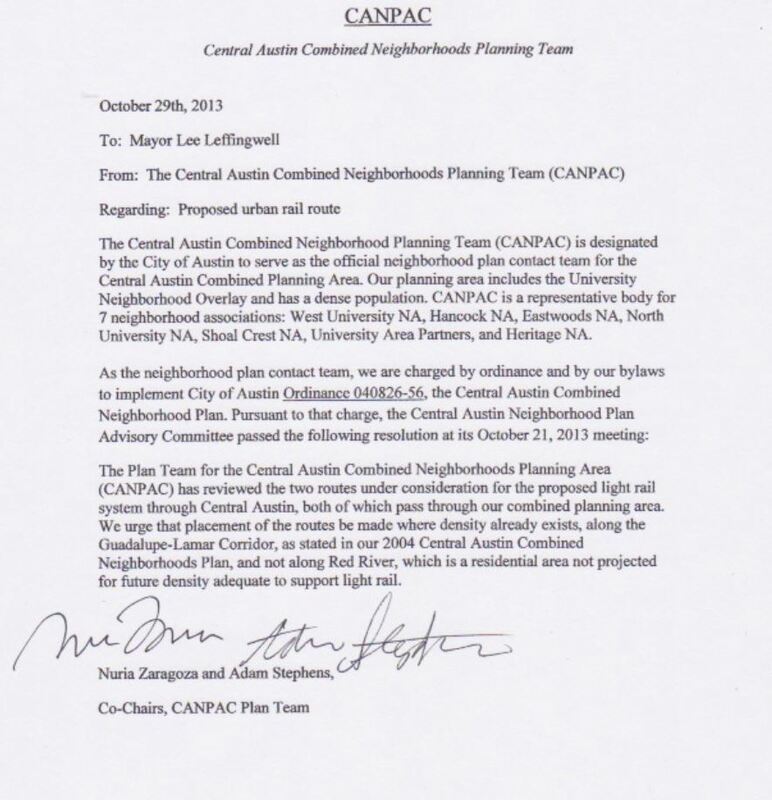 …the Northfield Neighborhood Association supports a phase one locally preferred alternative to include light rail service that connects the densely populated and diverse communities of North Central Austin to the cultural, residential, and employment centers of the University of Texas, the Capitol Complex, and Downtown Austin…. Crestview Neighborhood Association’s eastern boundary lies along North Lamar Blvd. Map: CNA. 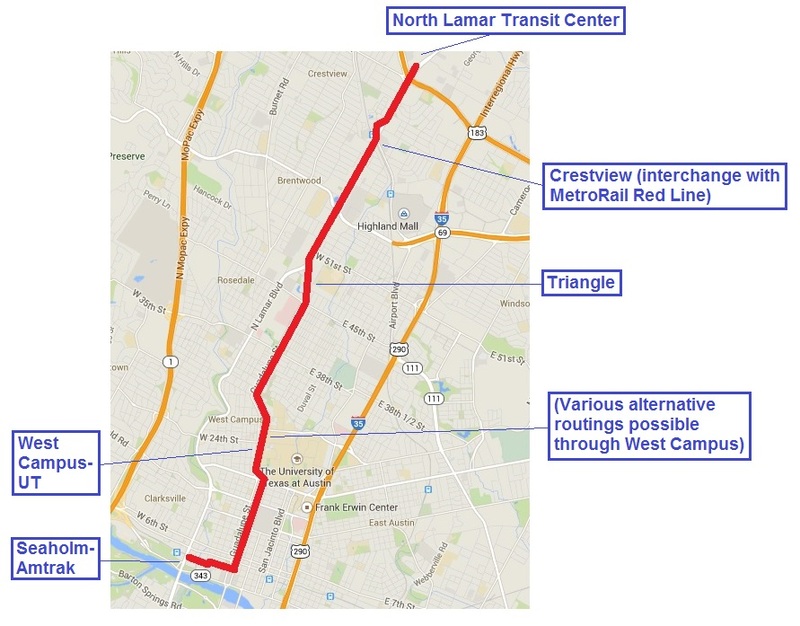 Still another major neighborhood association has jumped on board the effort to designate the Guadalupe-Lamar (G-L) corridor as its preferred route for urban rail (light rail transit). 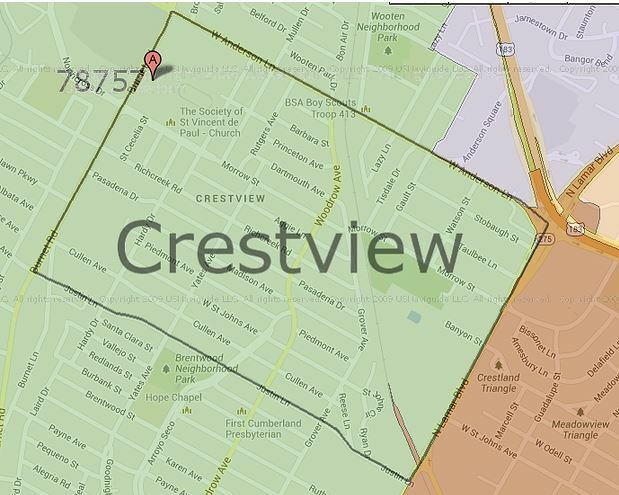 As indicated in the map at the top of this post, Crestview is a basically rectangular neighborhood bordered on the east by North Lamar Blvd., west by Burnet Rd., north by Anderson Lane, and south by Justin Lane. Encompassing the Crestview MetroRail station near Airport Blvd., the neighborhood touches the intersection of Lamar and U.S. 183 at its northeast corner, near the North Lamar Transit Center. 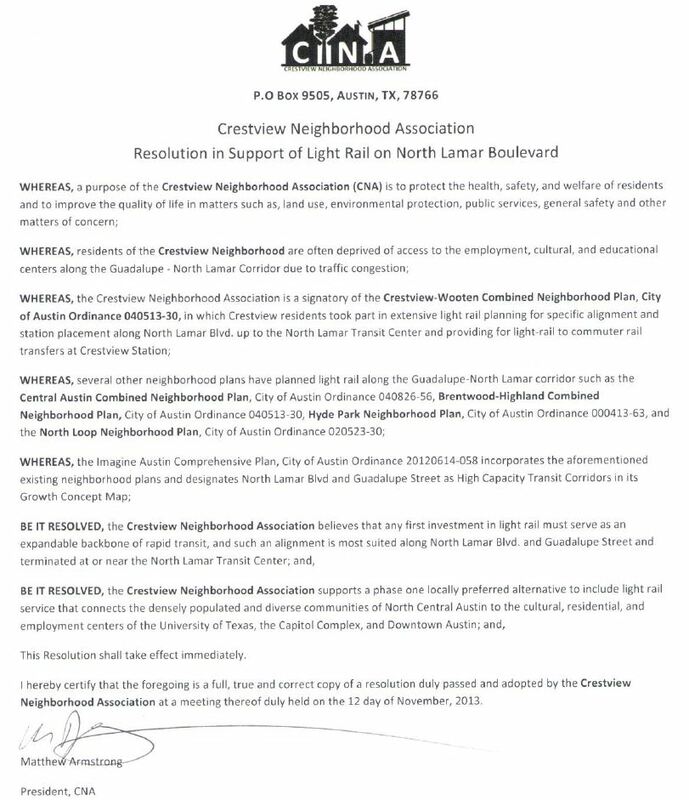 Image of Crestview Neighborhood Association resolution supporting urban rail in Guadalupe-Lamar corridor (click to enlarge). 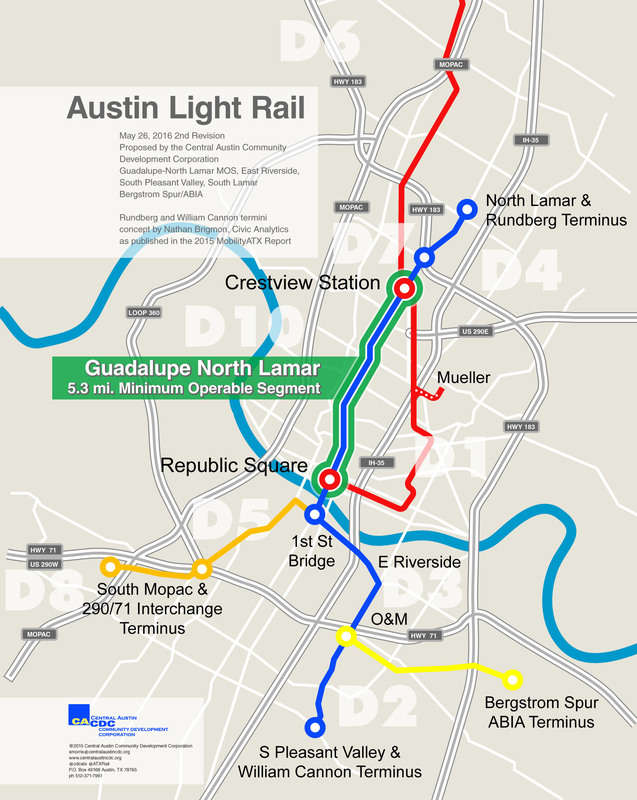 The Crestview endorsement is an especially noteworthy action because many Crestview residents had generally weighed in as opponents of light rail during both the initial presentation of a Guadalupe-Lamar urban rail plan in the early 1990s, and also during the campaign for a ballot measure to authorize a light rail system that narrowly failed in 2000. This new emergence of strong support is an indicator of the powerful community momentum for an urban rail alignment that has been building among neighborhoods in this corridor. Highland Neighborhood Association bundaries. Map: HNA. 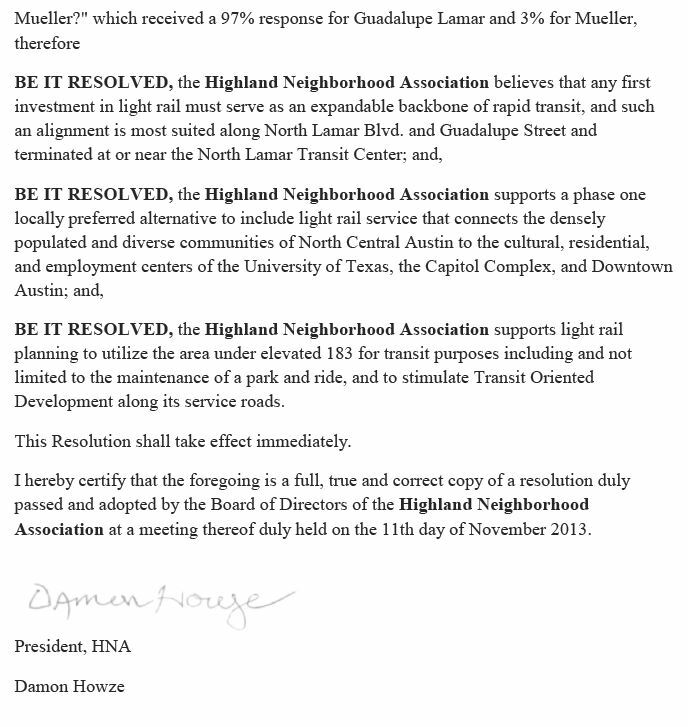 On November 4th, the effort to designate the Guadalupe-Lamar (G-L) corridor as the preferred route for urban rail (light rail transit, LRT) received yet another powerful surge of support with the endorsement of the Highland Neighborhood Association (HNA). 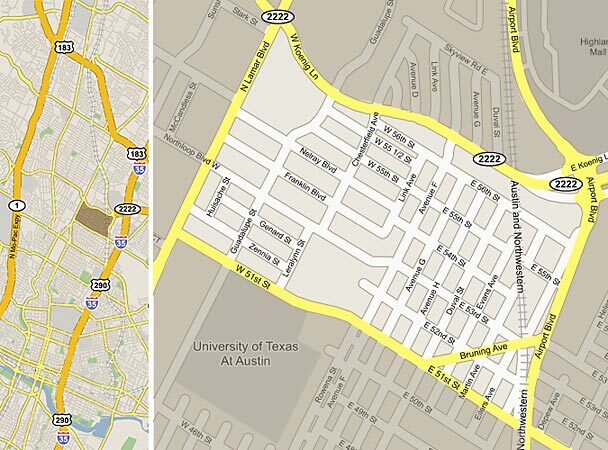 As the map at top shows, the western boundary of the Highland Neighborhood is mostly North Lamar Boulevard and Midtown Commons; its northern boundary is U.S. 183; and its southern boundary includes both Denson Drive and a segment of Airport Boulevard encompassing the Highland campus of Austin Community College. 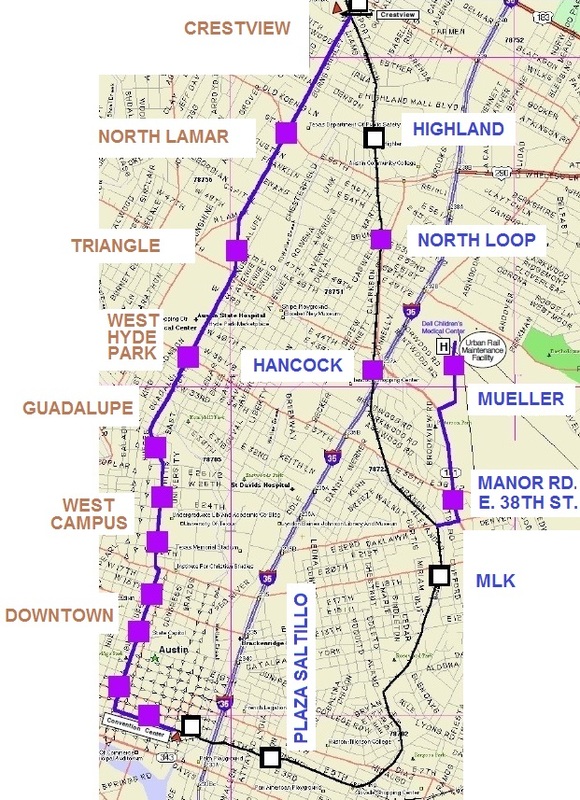 Highland is an important component of the ridership “watershed” for public transportation on the east side of North Lamar, and this would include the Guadalupe-Lamar (G-L) route proposed for urban rail (light rail transit). The Highland neighborhood should not be confused with Project Connect’s “Highland” sector (“sub-corridor”), which usurps the name but has only a very minimal geographical relationship. Images of HNA resolution endorsing Guadalupe-Lamar corridor for urban rail. BE IT RESOLVED, the Highland Neighborhood Association supports light rail planning to utilize the area under elevated 183 for transit purposes including and not limited to the maintenance of a park and ride, and to stimulate Transit Oriented Development along its service roads. This extremely significant endorsement of central Austin’s most important potential corridor for urban rail by one of the city’s most important neighborhood associations also has political implications that hopefully will not go unnoticed by local officials and decisionmakers. You are currently browsing the archives for the Community endorsements category.